I love Autumn. The air is crisp with a hint of smokiness, the trees change colors from shades of green to a vivid rainbow of colors, and Halloween is just around the corner.Katie of Wise Wife Soaps was inspired by Autumn weather when she created this Autumn Spice aromatherapy blend. It includes the warm, spicy scents we associate with colder weather. This is a WONDERFUL blend of oils and cinnamon to use in a scent pot in the kitchen. Clove Essential Oil is warm, spicy, earthy and slightly sweet. It’s energizing, stimulating and uplifting. Ginger Essential Oil is warm, fresh, spicy, woody, aromatic and sweet. It’s energizing and uplifting. Cinnamon is one of my favorite spices. It has a fragrant, sweet, spicy and warm scent. Cinnamon is very invigorating and uplifting. When you combine all of these ingredients, you have a warm, uplifting Autumn scent that will make your home smell wonderful. Katie’s recipe is simple and the directions are very clear. I also enjoyed her discussion of each ingredient and its role in the final blend. Very nice recipe! 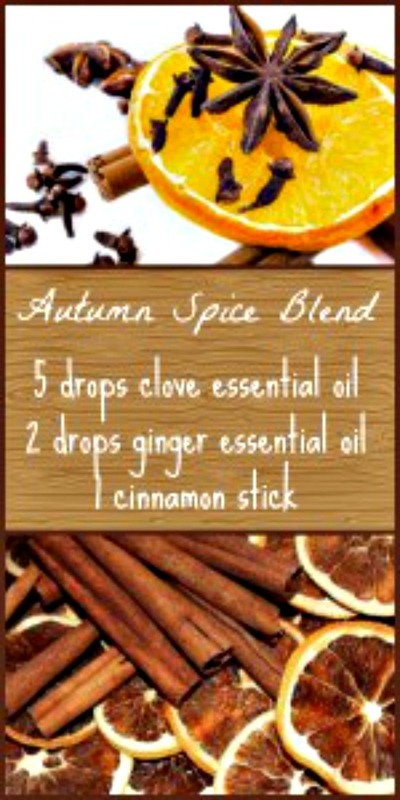 Visit the How to Make An Autumn Spice Aromatherapy Blend link below to see the recipe.